Outbreaks on your forehead can be caused by toxins build-up in the body due to poor digestion. When your body contains more toxins than your liver and kidneys can remove, it causes your liver and kidneys to have difficulty in expelling toxins and waste properly. When that happens, your body expels toxins through your skin. 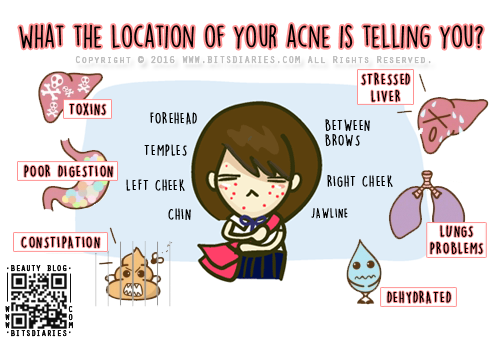 And that means pimples will come out to play. Outbreaks on this area can also be caused by stress, your fringe/bangs and cap. - Improve digestion by chewing your foods thoroughly before swallowing it. - Eat fruits that help in digestion like papaya, kiwifruit, banana etc. - The liver and kidneys require water to detox effectively, so drink more water. - Avoid or reduce drinking sweet carbonated drinks. If you get a craving for flavored drinks, try lemon water or detox tea (bags) like green tea and ginger tea. - Have a good sleep routine everyday. Go to bed early before 11pm. Why? I will explain it in other points later. - Reduce your stress level by doing what you enjoy. For example, meditation, yoga, listening to music, exercising, playing games etc. All of us will feel stressed at some point in our lives. Arm yourself with the positive ways to handle stress and enjoy life! - Wash your hair cleanly and keep your fringe/bangs out of your face (clip it up) especially in the summer/hot weather. - If you wear a cap, make sure you clean and wash it regularly because your hair and face secrete sebum and sweat that rub off onto your cap. So wearing a dirty cap increases the chances of getting zits. Pimples flare out in this area can be caused by poor lymphatic circulation, gallbladder problems, fatty diets and eating too much processed foods. It can also be caused by your hair, cap, spectacles and/or sunglasses. - Massage your face to stimulate lymphatic circulation. - Sleep before 11pm because the gallbladder functions most actively between 11pm to 1am when you are asleep. - Avoid or cut back on processed foods, junk foods and fast foods. - Wash your hair cleanly and keep your hair out of your face. - Wash your cap and clean your eyewear such as spectacles and sunglasses regularly! They all trap makeup, oil and sweat from your face, making it a breeding ground for bacteria. Each time you wear them, you are transferring dirt back onto your face. So make sure to wash and clean them. It's a sign of liver and heart problems. Usually associated with symptoms like chest tightness or irregular pulse. It can also be a result of having late night meals, too much fatty diets, alcohol and tobacco (smoking). - Have a good sleep routine. - Avoid diet high in fats. - Avoid or cut back on alcohol. - Avoid or reduce smoking. - Avoid strenuous exercises and activities. Pimples on the nose indicate poor digestive system and gastrointestinal imbalance. Usually associated with symptoms like bloating, constipation, abdominal pain... This area is prone to overproduction of oil which can result in clogged pores and blackheads. - Avoid or eat less oily and spicy foods. - Avoid pungent foods like garlic, spices etc. - Eat more fruits and vegetables. - Exfoliate and use nose strips once a week. Outbreaks on the left cheek are linked to respiratory system and also can relate to liver and stomach problems. Pimples on the right cheek are linked to lungs and stomach problems. Usually associated with cold hands and feet, and prone to allergic reaction. Stress, overeating and having diets too high in sugar, dairy or refined carbohydrates also play a part in triggering acne; in addition, dirty hands, pillowcases and cellphone are also the suspects behind your acne outbreaks in these areas. - Have a good sleep routine. Don't stay up late. Why? Because the liver springs into action between 1am to 3am when you are asleep. That means, it works more effectively in cleansing toxins, breaking down and repairing old or damage blood cells, as well as regulating hormone production; thereby, helping with your body's overall detoxification and functioning process. - Improve your lung problems by exercising regularly. The best time to exercise is between 7am to 9am because the lungs functions most actively during this timing. - Avoid or cut back on processed, junk and fast foods. - Avoid diets high in sugar, dairy or refined carbohydrates. - Avoid touching your face with your dirty hands. - Wash your pillowcases regularly. - Clean the screen of your cellphone everyday with rubbing alcohol or anti-bacterial wipes (FYI, I use Dettol wet wipes). Usually caused by eating too much oily and/or spicy foods. - Practice good hygiene to wipe your mouth with a tissue after every meal. - If you wear lip balm, try not to apply it out of the lips border. The main cause is hormone fluctuations. That explains why women tend to breakout in this area during that time of the month. Other causes can be stress, digestive problems (constipation) and resting your chin or jawline on hands or arms. - Balance your hormones by avoiding foods and drinks that are high in sugar, dairy or refined carbohydrates such as soda, coffee, milk, cheese and cakes. Also avoid eating too much oily and spicy foods. - Girls... Avoid eating and drinking too much cold foods and drinks especially the week before and during menstrual period. - Eat more fruits and drink plenty of water. You can also drink detox tea to aid in detoxification. - Reduce your stress as much as possible. - Avoid eating right before bed time. - Have a good sleep routine! So that your body system can function properly. - Avoid resting your chin and jawline on your hands or arms. - Have a good skin care routine which involves a daily ritual of cleansing, toning, and moisturizing the skin. And if you wear makeup, make sure you thoroughly remove all traces of makeup. - Always bear in mind that sleep is the time the body can undergo repair and detoxification at its best. For your information, every organ in your body has a maintenance schedule to keep on a daily basis. And from 11pm to 7am is when your body undergoes repair and detoxification. So a good sleep routine is a key component in keeping your skin clean and clear. - Another key component in keeping your skin healthy is your digestive system. Try to avoid constipation! How? Drink plenty of water and avoid eating spicy and oily foods. I recommend to eat yogurt and/or fiber-rich foods (including vegetables and fruits) like bran, spinach, beans, banana and kiwifruit, as they help to soothe your tummy and keep your digestive tracts running smoothly. By doing so, you can reduce toxins buildup in your body, and thereby reducing the chances of your body eliminates toxins through your skin. - Consider keeping a food diary to find out what foods trigger an outbreak or worsen your acne, so that you can stay away from those foods. hai ashley did u have ig ?